This entry was posted on February 5, 2013 by Jessica Anderson. At the beginning of each year, the Awards and Recognition Association (ARA) holds its trade show in Las Vegas. 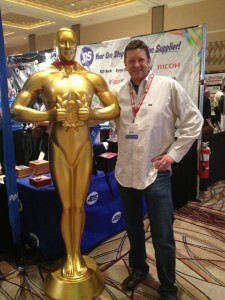 While the focus of the show is on new products and innovations in the awards industry, I get more out of it than most. Don’t get me wrong, I do want to know what new products are out there, as most of our new awards selection does come from the show. I also use it as an opportunity to select new suppliers. When meeting a new vendor, I like to know their terms of service, order processing times, shipping times, guarantees, and if they offer volume pricing. I typically select 2-3 to test-drive. I feel fortunate if one of these turns out to be a long-term supplier for us. Jeff with the giant JDS Oscar-replica trophy at the 2013 ARA Trade Show. The purpose of this post, however, is to dive deeper into what I get out of the show. I feel like there are 4 additional reasons that make this trade show worthwhile, including industry trends, education, giving back, and camaraderie. What is happening now that is new? What are the latest and greatest products and tools? What pains suppliers and other retailers? This helps me know what others are doing successfully and what pitfalls to avoid. This affects our business by enabling us to provide leading products and services to our customers. If I didn’t attend (and a lot of people don’t), I would be doing a disservice to my customers by putting my business on cruise control and not trying to improve. Continuing education is also an important benefit to attending the show. Although I have attended dozens of seminars in the past, I can never get enough. There are always small nuggets of information that I get from each presenter. They also serve as a way to get to know other retailers and see how they approach business. This can be eye opening at times, since there is a wide-range of business people at the education seminars. Nevertheless, there is always something to be learned – either from the seminar or the attendees. This year, I was a panel guest at a seminar, and it was an eye opening experience being the teacher instead of the attendee. Since the Awards and Recognition Association has provided so much for me in the past, the least I can do is give back. This year, I have been elected to serve on the ARA board and will be guiding the direction of the organization and the industry into the future. It is an honor and a humbling experience to be given this opportunity, and I look forward to giving back even more to an organization that has helped me and my business so much in the past. The ARA has also generously awarded two of my staff college scholarships for their children through the ARIEF Scholarship Program. This organization does a great job of giving back to our community, so I want to do my part to support them. I don’t know everything by any stretch of the imagination, but I do have 20+ of years in the industry. I have a lot of experience when it comes to growing an awards business, issues with employees, customer satisfaction issues, and more. To share some of these experiences with the end result helping someone else is a great honor. Fun, Fellowship, Friendship. Being in the company of individuals in the same industry is heart-warming. Whether on the show floor, in a seminar, or (my favorite) after-hours socialization, it is nice to spend a couple of days with people who understand what you do, how you do it, and what you go through. Whether you are a fellow ARA member or one of our customers, I hope you have enjoyed reading what I get out of attending the ARA trade show. It's a great organization and I'm glad to be a part of it.